Please help me publicize the April 28th and future concerts! I have just sent this email request to the Brockton Symphony "family" to share my ads via THEIR social media links. You too can help support live classical music, even if you are not located nearby. Since 2005, I have been producing one-minute "commercials" for each of our concerts, We have had arrangements with local radio stations to play them as public service announcements and/or as paid advertisements. It looks like we may not have such an arrangement for the coming season, and even if we do, the reach (at least potentially) of social media far exceeds that of radio stations. Here's how you can help our beloved "BrSO" without even joining any committees: Share my ads on YOUR social media outlets - your Facebook, Twitter or any other platform, along with any blog or website you may control. I always begin by uploading the ad, along with the text of it, to my Soundcloud page, which is easy to share directly to the bigger platforms or to copy and paste a code for the link to any other sites. It doesn't take long, but it can help fill the seats while sharing the joy of our world class symphony. Here's my promotional radio commercial for the next performance by the Brockton Symphony Orchestra. I will be there to serve as Master of Ceremonies. 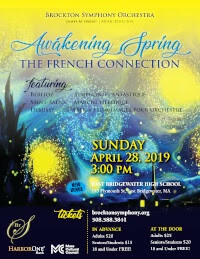 On Sunday, April 28th, the Brockton Symphony Orchestra presents the final orchestral concert of our 71st season, Awakening Spring: The French Connection, featuring intense, breathtaking works by French composers, at 3:00 PM in the East Bridgewater High School. You’ll be stirred by power of Saint-Saëns’ Marche Héroïque, delighted by the sweep and textures of Debussy’s Ibéria from Images for the Orchestra, and transported by the sumptuous delirium of Berlioz’ Symphonie Fantastique. Adult tickets purchased at the door are $25.00, seniors and students $20.00, children 18 and under, free. Save $5.00 and order in advance at Brockton Symphony.org or by calling 508-588-3841. That’s 3:00 PM, Sunday, April 28th at East Bridgewater High School, 143 Plymouth Street in East Bridgewater. Brockton Symphony's All-Beethoven Program is Coming! I have the great good fortune to serve as emcee or Master of Ceremonies for the Brockton Symphony Orchestra. My title in the program book is actually "The Voice of the Orchestra," which may be misleading because I don't sing at the concerts. I also produce a radio (and social media) commercial for each concert. Here's one for the upcoming and very exciting all-Beethoven program in March. Here's the text of the promo: Beethoven - Everyone's heard of him, and almost everyone thinks of those four notes - but there's so much more! On Sunday, March 3rd, the Brockton Symphony Orchestra presents Winter Light: A Beethoven Triple Delight at 3:00 PM in the Christ Congregational Church. Along with the power of the familiar 5th Symphony, thrill to the sensational Aleksandr Poliykov in Piano Concerto No. 4, then the magnificent orchestra in the Leonore Overture No 3. Adult tickets purchased at the door are $25.00, seniors and students $20.00, children 18 and under, free. Save $5.00 and order in advance at Brockton Symphony.org or by calling 508-588-3841. That’s 3:00 PM, Sunday, March 3rd at the Christ Congregational Church, 1350 Pleasant Street in Brockton. The Brockton Symphony Orchestra – A Greater Brockton Treasure! Sponsored by Harbor One Bank.